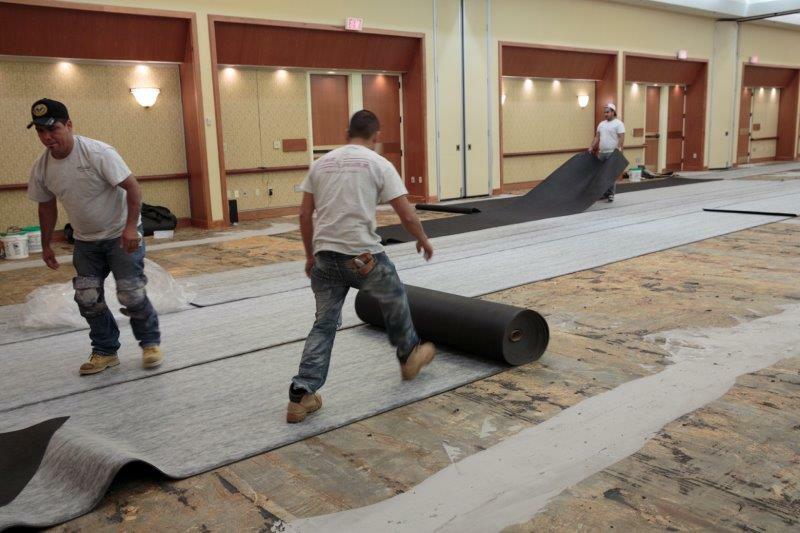 The importance of knowing the construction of woven wool carpet is as critical as the installation itself. Understanding how to manipulate the product when needed to have it conform to its surroundings is essential. Acclimation is a very important step in achieving this goal. 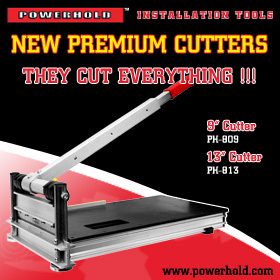 Carpet should be cut and laid the in the area it is to be installed for a minimum of 24-48 hours before installation. Stretch-in Installation: On loop pile woven wool carpet, you should never use a cotton head on the power stretcher. A cotton head will cause the yarn to swell and once done, it cannot be corrected. If you use a cotton head on wool, and this doesn’t happen, consider yourself lucky, because the day that it does happen it will be expensive to replace. When seaming a tufted wool carpet using a traditional iron, never run it on the temperature setting of 3 or 4 as doing so will cause condensation to develop in the yarn from the heat, leaving a dark line down the seam. Your customer will find this dark line objectionable. Although, with it being condensation, the line will lighten to its original color as it dissipates. For tufted wools, the iron should always be run on a temperature setting of 2 – 2 ½, and make a slow seam. New radio wave technology seaming tools can also be used on wool carpet. After seaming, make sure to seal the seam. The best seam sealer to use on tufted wool is a rubber-based latex. Sealing will keep the carpet from delaminating, and will give it a better tuft bind at the seam. The recommended pad for low profile wool carpet is a 32-oz. felt pad or a frothed pad. Do not use rebond pad with jute back carpet because rebond is a petroleum-based product and incompatible with natural fiber jute. This also applies to all carpet with jute components in the backing (velvet, Wilton and Axminster). Keep in mind for tufted wool carpet when the backing is being applied to the carpet, it goes through a coater (similar to a large oven). So when the carpet comes out and gets rolled up it stretches which can distort the pattern. Hence why acclimation is so important. Carpet does have memory so it will come back to some degree, but allowing it to acclimate makes the pattern much easier to match. As far as bow and skew, as it goes through the coater, both sides may go through straight but the center may lag a bit, creating that bow. Or, one side might go a little faster than the other creating a skew. After it comes out of the coater and gets rolled up these issues are further compounded. 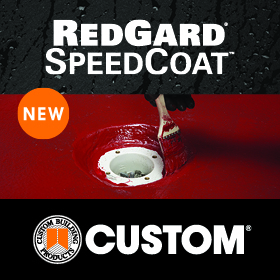 Direct Glue Installation: The trowel size should be 1/8” x 1/8” x 1/8” U-notch trowel. As you fold the carpet into the glue, use a 75-lb. roller, on top of the carpet to push any air bubbles to the edge of the room. Do not wait until the end of the installation or the air bubbles will be trapped. Again, seam sealing is extremely important even for a direct glue. 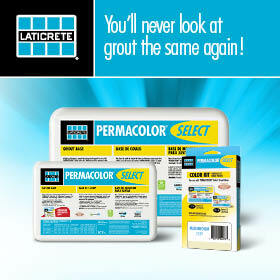 The adhesive selected for these products should always be approximately 65%-68% solids. 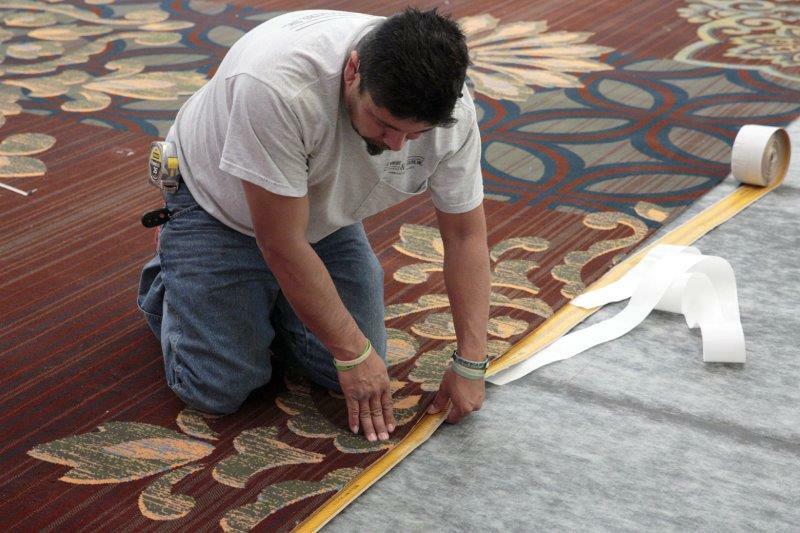 When laying out the job, tufted wool carpet roll sequence is very important. Remember the pattern stretches as it is rolled up. Lay each cut side by side from roll #1 to make matching the pattern much easier to manipulate, especially when you don’t have time to allow the carpet to acclimate. Consider when a job is ordered, and the mill tells you X amount of feet will be coming from roll 1 and X amount of feet will be coming from roll 2. Making a purchase this way may make it next to impossible to match up the pattern. Double Glue Installation: The trowel size should be 1/8” x 1/16” x 1/8” U-notch trowel for smooth back carpet. The roller should be 35-50 lbs. The trowel size for the pad should be 1/16” x 1/16” x 1/16” square notch trowel. Use a pressure sensitive glue for the pad. Further, before laying the pad into the glue, test the glue for readiness. The adhesive should be tacky to the touch and not transfer to your finger. Never place the pad into the glue while the glue is wet. The glue must have time to off gas. If you don’t give it that time, then it will off gas on its own causing bubbles to appear. It will be extremely difficult to remove them, if you can. Note: Never cover the carpet with plastic as the plastic will encapsulate the floor and draw moisture, causing the carpet to mold and mildew. Do not walk on it for 24 hours. No rolling traffic for 72 hours. No vacuuming for 72 hours, or the carpet’s bond to the pad may break. No carpet cleaning with water for a minimum of 30 days. Allow the woven carpet to acclimate for 24 to 48 hours. Stretch-in Installation: With velvet carpet, there is more stretch in the width than in the length. It is difficult to match a pattern due to the lack of stretch. Therefore, roll sequence is extremely important on velvet carpet as well. Velvet and tufted carpet products have similar installation protocols. Never use a cotton head on loop pile wool carpet. When row cutting a velvet for a seam, pay attention to the chain stitch and avoid cutting into it. The stretch-in installation guidelines for tufted carpet also apply to velvets. Remember, the stretch is different in the velvet than it is in the tufted. 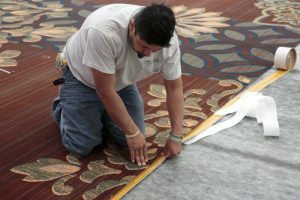 Direct Glue Installation: Follow the instructions outlined for tufted wool installations while keeping in mind with velvet carpet, there is more stretch in the width than in the length. It’s difficult to match a pattern due to the lack of stretch. Double Glue Installation: With velvet, the method is the same as for tufted wool. Keep in mind there is very little, if any, stretch in the length. Manipulating a pattern may be difficult, therefore make sure the roll sequence is not forgotten. The next article will cover how to properly install Wilton and Axminster wool carpets. For more information, go to www.nficnet.com, under installation guidelines.